Please contact the center for group tours and our schedule for open tours. EVRC offers exciting, up-close and personal Guided Tours for your group or organization. Our basic Guided Tour is approximately one hour and a half long. A $ 5.00 donation per person with a minimum of 8 people is suggested. 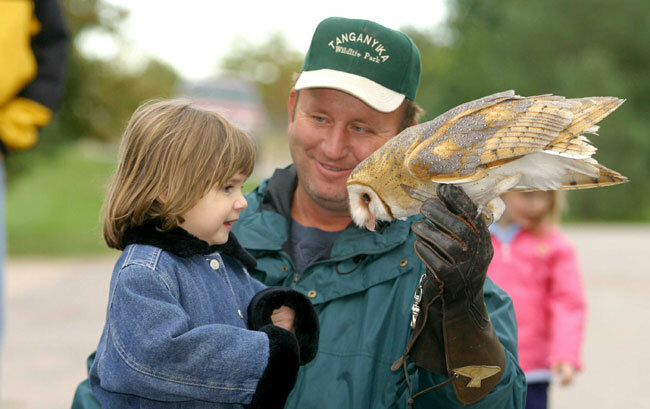 Program will include an educational, up close, out of cage viewing of several of our birds, and 'touchables' are available for children such as wings, feathers, and talons. Cameras are encouraged, as this is a once-in-a-lifetime experience for young people to actually interact with such incredible birds. A covered Pavilion, able to seat 45 people, is available for lunches, cookouts or catered dinners for larger parties. Restrooms and a large parking lot for buses are onsite. Tours must be scheduled ahead of time and may be set up by calling (316) 393-0710 or send an email to raptorcare@aol.com. Please include your name, contact phone number, and your preferred date and time for the tour. Click here to see the ad that was in the local Times-Sentinel west Wichita paper, or follow our links to learn more about us.